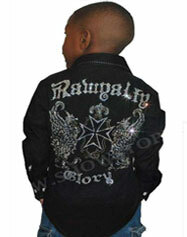 Show Stopper Men "Soldier of Peace" designer shirt has premier design that will completely fascinate your personality. The shirt is available in various sizes in two collar styles: Crew neck and V-neck. The crew neck is available in all acid colors, yellow, sun fire and burnt orange. The V-shaped neck is available in black, navy, royal blue, white, red, and brown. On the top of the backside of the shirt it is written ‘Let there be’ and the bottom has the word ‘Peace’ which makes this shirt in relation to harmony. In addition it has soldier proudly holding the flag and pushing into the word ‘Peace’. The front of the shirt has the label ‘Show stopper’ and it is created beautifully with sparkling fine stones of good quality. 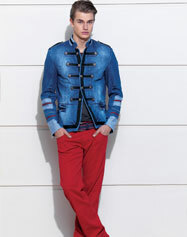 Show stopper Men “Soldier of Peace” assures 100% combed ring-spun cotton with blind stitching and bottom hem on sleeves. In addition it also has shoulder to shoulder tape for your comfort. Show stopper Men “Soldier of Peace” gives a positive message of peace which will also create your image as noble in your social circle. Order Show stopper Men ‘Soldier of Peace’ now and become trendy in your own way.